Loaded with the features you want to cover a wide range of fishing. 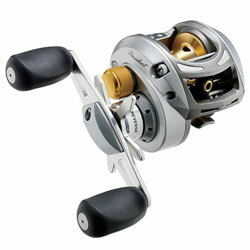 Includes a 9+1 bearing system with nine double shielded stainless steel ball bearings and a one-way clutch instant anti-reverse bearing, rugged one-piece aluminum frame, aluminum handle sideplate, patented six-pin adjustable centrifugal brake system, multi-disc carbon fiber drag system, Soft Touch thumb bar spool release and titanium line guides. "I own a trion. I have fished 3 seasons with it and it currently needs it's second paw. I bought a president last year and i had to put a paw in it this year. Not a major repair nor costly, but very frustating." "i have has 4 of these reels on a guide boat for over 4 years and they are dependable and worth the money." "This is my first baitcast reel...I'd avoided them and opted for spinning reelings based on a bad experience I had with a "value priced" baitcast reel many years ago...that reel backlashed and was a nightmare..."
"I got this reel as a Christmas gift so I had to fish it over the Jan 1st Holiday weekend. I paired it with the MoJo Med 6.6 rod and 10 pound test Evolution line and hit the Flats in Loxahatchee."